Hey you! 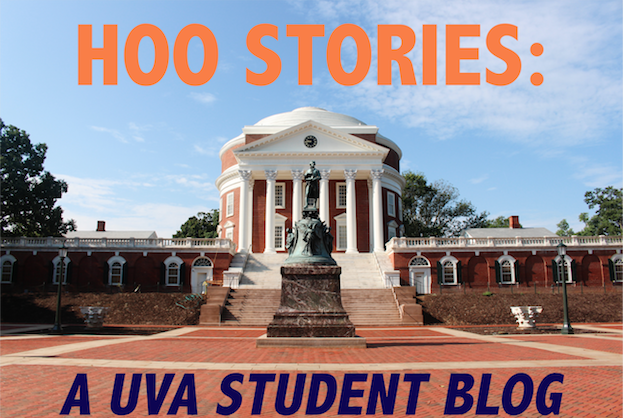 Do you want to be a real UVA student? Well, unfortunately I can’t be of much assistance with that, but I can definitely show you how to talk like one! Sarah Seale here, a third year media studies major and your one and only source to the lingo you’ll hear around the grounds of Mr. Jefferson’s university. You may already know that we wahoos say “grounds” instead of “campus” and “third year” instead of “junior” (traditions established by TJ himself), but those are only the beginning. Before we proceed, I must confess that I can’t help but read this in my head with Kristen Bell’s voice. This is my first real blog post and I have already convinced myself that I am Gossip Girl. Step aside, Humphrey. Let’s get started! The Lawn: the huge grassy area in front of the Rotunda, which is the iconic building designed by Thomas Jefferson. The student body gathers here for awesome events like Rotunda Sing in August, Lighting of the Lawn in December, and, of course, graduation. It is also home to 54 esteemed fourth years (“lawnies”) each year. Have a picnic when it’s nice outside, which in Charlottesville could even be December 5th! Virginia weather can never seem to make up its mind. Also, streaking the lawn is one of the many things you are supposed to do before you graduate. Make sure to keep track of your clothes! Rugby Road: a frat house-filled street known for partying. It’s a popular place to roam on weekend nights, if that’s your thing! Old Dorms and New Dorms: Most of the first year dorms possess one of these two labels – “old dorms” on McCormick Road and “new dorms” on Alderman Road, categorized by when they were built. Old dorms are, well… old, but they have a classically collegiate quad and are very close to classes. If you’re fortunate enough to live in a brand new dorm, you’ll have the luxuries of elevators, lounges, and fancy big-screen TVs. Lucky ducks. Other dorm options for first years include the Gooch/Dillard area and residential colleges like Brown, Hereford, and the International Residential College (IRC). The Pav: a food court-style dining area that offers Chick-fil-A, burritos, smoothies, and more! It’s a nice alternative to the three main dining halls – O Hill, Newcomb, and Runk. JPJ: John Paul Jones arena, home to our men’s and women’s basketball games as well as big concerts and shows. Taylor Swift performed there this September! The Corner: the stretch of restaurants and stores along University Avenue, located only a couple minutes’ walk from grounds. It includes local favorites like Bodo’s, for tasty and cheap bagels, and Littlejohn’s, the 24/7 deli, as well as chains like Starbucks and Dunkin' Donuts. Pro-tip for pizza place Mellow Mushroom – super fun trivia on Wednesday nights doesn’t start until around 9, but make sure you get there far ahead of time to get a table! Additionally, the streets near the Corner are popular choices for off-grounds housing once students enter their second year. Club Clem: the unfortunate situation of studying in Clemons Library, open 24 hours during the week. Go at your own risk! Beta Bridge: the bridge across from the Beta fraternity house on Rugby that has been painted over and over and over again. Paint it to advertise for an event or just to wish a friend happy birthday! The Good Old Song: a song and chant traditionally sung at sporting and other university-wide events, where everyone puts their arms around each other and sways. Don’t worry – it’s not weird even if you find yourself next to strangers. You’ll definitely get confused when you sing it for the first time at Convocation (Uni-V Virginia? What the what? ), but you’ll be a pro by the first couple home football games. And there you go! There is much more lingo for you to learn, but I hope this list provided you with a good starting point in sounding like a true cavalier. Wahoowa! When trying to make a college decision, most high school seniors put little to no thought into the kinds of food available to them during the school year. Although it shouldn’t be among the main deciding factors, it will definitely be a relevant concern once you’re actually at school. Some schools are known to have great food, and to be honest, UVA is not one of them; the food in the dining halls are of typical college quality. However, there are many different options offered to students. There are three dining halls: Observatory Hill (O’Hill), Runk, and Newcomb, and all are relatively spread out and easily accessible from all parts of Grounds. Each has a well equipped salad bar, sandwich station, pizza, vegan options, gluten free options, stir-fry, desserts, etc., demonstrating the wide variety of food available. However, when you get tired of these typical foods, which you will, there are other alternatives. With the meal plans comes an option for a meal exchange, in which a meal swipe can be used for certain foods at certain times of the day. These can be used at places such as the Castle, Crossroads, or the Pavilion for Chick-fil-a, Sbarro, Pao’s, and more. For food not included on meal exchange, such as sushi and burritos from the Pavilion or other menu options from Sbarro or Chick-fil-a, Plus Dollars included in the meal plan on your student ID can be used as money. These options will satisfy your On-Grounds eating needs. If these are not enough, there are many different restaurants off grounds. 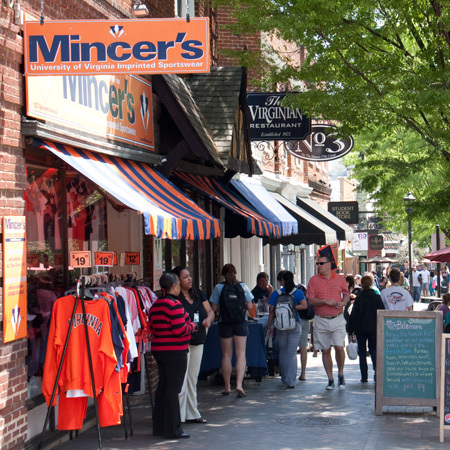 On the Corner, right near the UVA Chapel, there are many restaurants such as The Virginian, Boylan Heights, Lemongrass, Sushi Love, and more that provide a variety of different kinds of cuisines. If you aren’t looking for a sit-down meal, you can also head down to the Corner for quick burgers from a local favorite, The White Spot, a slice of pizza from Christian’s or Mellow Mushroom, sandwiches from Little John’s, or frozen yogurt from Arch’s or Berry Berry. There are also more options at Barrack’s Shopping Center near John Paul Jones Arena, which is accessible by the Northline bus route. The options here include Panera, McDonald’s, Taco Bell, Chipotle, Buffalo Wild Wings, and more. Many places also deliver to the UVA campus, some at very late hours of the night. There are many Chinese takeout places and pizza places close to campus, as well as an upcoming chain called Campus Cookies that will deliver desserts! So far this semester, I’ve had pizza and wings past 12am, warm cookies within 20 minutes, and even sushi and various Chinese dishes delivered right outside my dorm building. Don’t underestimate the times that while up late studying you suddenly get a craving for Chinese or pizza; they even deliver to the library! This provides a lot of flexibility and convenience for all UVA students. The average quality food in the dining halls is well balanced by all the other options available to students. Meal exchange is especially great because it does not cost extra money out of pocket, which is important because you will all become broke college students soon enough!